And I survived the Mt. Fuji climb. It was a grueling 6 hours of climbing in the dark over loose lava rock, large stones, finding the guide ropes to stay on the path (my flashlight died half-way up the mountain, so I had to rely on the lights of others), and in random spots, shoddily constructed steps of rock and wood. The pain in my legs today is the only thing that makes it seem real that I actually did it. Otherwise, it seems like it was a dream – a mostly bad dream at that :) The climb is quite difficult, and I have absolutely no idea how grandmas and children climb the thing, because apparently it’s a frequent thing for them to do so. I started climbing at Station 5 which sits at 2400 meters (7874 feet)– took a bus to here and climbed up the Fujinomiya Route. There are other stations along the way to take a rest and get food and water, as well as a first aid station at Station 8. Station 10 is at the top. Our group was really lucky, it only rained for about 15 minutes and it was near the lower stations where it wasn’t as cold. Last weekend it rained almost the entire night, so climbers had to be extremely miserable…and let’s just say climbing was pretty miserable most of the way anyway. I climbed mostly in a group of 5. We took short frequent breaks to allow our heart rate to go down (it’s amazing how hard my heart was beating in my chest!!) along the way and longer breaks of 10-20 minutes at each station. We began climbing at 10:00 pm and arrived at Station 10 at 4:15 am, so we paced it just about perfectly. That gave us time to hike up another smaller hill near the crater to watch the sunrise on the east side of Mt. Fuji. It was crazy at the top to be literally above the clouds and see the patches of cities below and in between clouds. Before reaching the peak, the night lights in the distance were so beautiful – they kept me going, along with a little oxygen every now and then. 1 in 4 people get altitude sickness – luckily I wasn’t one of them, but decided that since I had to pay for the oxygen anyway, I might as well use it up :) It was nice on breaks and put me instantly in a better mood – apparently my brain was lacking the oxygen it needed haha. Maybe I should bring that tank to school! I took in the sunrise cuddled up next to my climbing buddies for warmth. I actually didn’t wear all the layers that I brought up the mountain, mostly because I didn’t want to bother with putting them on just to take them off again on my way down. 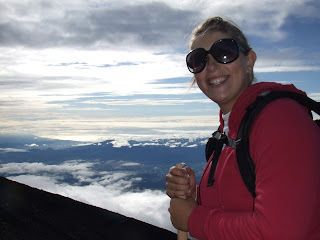 After watching the sunrise over the aerial view of Numazu, Jenny Dion and I continued to the literal highest point of the peak which sits at 3,776 meters (12,388 feet). Here is the weather station and a monument dedicated to the highest point in Japan. It took a lot of energy to climb that extra bit after going all the way up the mountain, but I didn’t wanna wuss out after all that way!! There is also a temple that you can also hike to once you reach the top and you can also hike around the crater, but we decided not to do it for time sake. I still saw the crater, just not every side view. Coming down took about 4 hours, but with a lot of breaks along the way to take in the view (when we weren’t stuck in the middle of a cloud). I honestly can’t say which was worse, going up or down. Going up was extremely hard, but I couldn’t see my destination (save a bright light coming from each station), so it was just focusing on the moment at hand and pushing as hard as I could. Coming down however, you could see how far you really had to go, and it was hard not to think “man that station looks far away…and there’s more after that! !” Coming down was pretty dangerous as well. The loose rock and steeper grade makes for an interesting descent. I actually fell like three times in some loose spots, but I was playing it safe, so they were only small falls. I actually saw a guy take a huge spill. In some spots it’s actually easier to just like shuffle-run down the loose rocks and gravel, but this guy apparently thought it would be easier to run down the entire thing even among the huge stones. Not the brightest guy. He went flying probably about 30 meters, doing a few somersaults and tumbling over rocks before coming to a stop. He apparently broke his wrist – he’s really lucky he didn’t land on his head!! I can’t imagine having to come the rest of the way down (this was near the top before even the 9th station on the way down) with a broken arm!! Definitely made me be super careful on the way down!!! The trek took a toll on my mind and body, considering I not only stayed up all night long, but I was actually climbing all night long. I arrived back to my apartment about 12:30 pm the next day to prepare myself for giving a speech the next morning at school for the opening ceremony. The moral of this story: if you come visit me and want to climb Mt. Fuji, you will have to BEG and BRIBE me to do that again. Awesome experience, not to be repeated too many times, but worth the exertion. I hope you all had an amazing Labor Day weekend – my 3 day weekend is coming up in a few weeks. Have a great week!